If you spend all of your time decorating, shopping, cooking, cleaning and scribbling cards, you'll miss the best part of the Holiday Season: Getting out and making memories with your family! Folks in Houston get it. They take advantage of their moderate “winter" temperatures (forecasted to be a balmy 57- to 69-degrees for the rest of December) by venturing outside and having some fun. Here are some seasonal highlights. Photo credit: Houston Zoo. 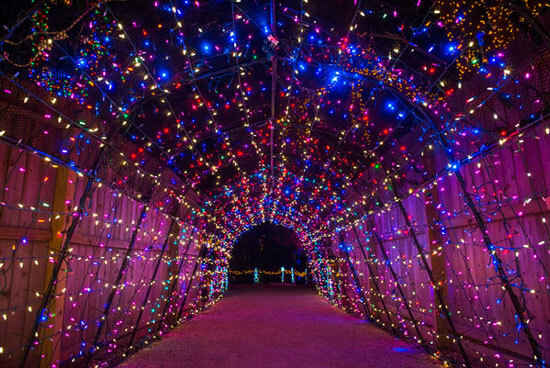 Entrance to Zoo Lights – The Enchanted Forest. A forest walk through a beautiful holiday lights display that includes the Doll House Village and garden-sized trains. Houston CityPASS holders can use their Children's Museum of Houston ticket to take a journey this season into the world of Dr. Seuss. Showing now through Feb. 23, 2014, Merry Grinchmas! – The Art of Dr. Seuss, takes visitors into the life of Theodor Seuss Geisel and his fun and otherworldly art. During Merry Grinchmas Week, Dec.12-24, make artificial snow, design Merry Grinchmas pop-up cards, create snowflake ornaments, and make a set of reindeer antlers just like the ones Max wore. During Happy New Year Week, Dec. 26-31, guests can mix-and-match a holiday outfit, make instruments, and draw a holiday portrait. On Friday and Saturday, Dec. 13-14 and Dec. 20-21, this special event at George Ranch is a journey back in time to Christmases from the 1830s to the 1930s. Enjoy a progressive Christmas dinner, music, hayride, and exclusive evening tours of the 1890s Davis Victorian Mansion and 1930s George Ranch Home. Watch the Christmas Boat Parade on Saturday, Dec. 14 at 6 p.m. at the Kemah Boardwalk, also a CityPASS attraction. Hundreds of boats will be spruced up and glimmering for the holiday cruise along Galveston Bay, so get there early for the best view. If you become bored with the boats, you certainly will be entertained by the Boardwalk's collection of rides, eateries and shopping. This event takes place on Saturday, Dec. 14 at 10 a.m. Not only do creators of the culinary delights have to be inventive, they have to be fast. They only have a few hours to build towering, tasty structures. More than 30 teams will be clamoring to claim the coveted Grand Prix de Show in front of 3,000 cheering spectators. The event is free. Families can enjoy a buffet at Breakfast with Santa on Dec. 14, 15 and 21-24 from 8-10 a.m. at Downtown Aquarium, another Houston CityPASS attraction. Guests can get photos with the bearded one, and may even catch him swimming with the fish. Cost is $15.99 for adults and $9.99 for children ages 3-10. Reservations are a must. Call (713) 223-3474.
is holding holiday events on its 7,716 square-foot outdoor rink. Visitors can glide and giggle while enjoying an assortment of holiday-themed activities, including skating with Santa, concerts, movies and more. I have no idea how Santa can be at all these places, but there you go. Catch the glitter and shimmer of this year's Houston Zoo Lights, which has added another million lights to the spectacle. But you don't have to hurry— it will remain open to the public through Jan. 4, 2014 (except for Dec. 24-25). Even with a Houston CityPASS ticket, keep in mind that the Zoo Lights is a separate event, and the zoo closes for the day at 5 p.m. and opens up for Zoo Lights at 6 p.m.
Photo credit: Houston Zoo. 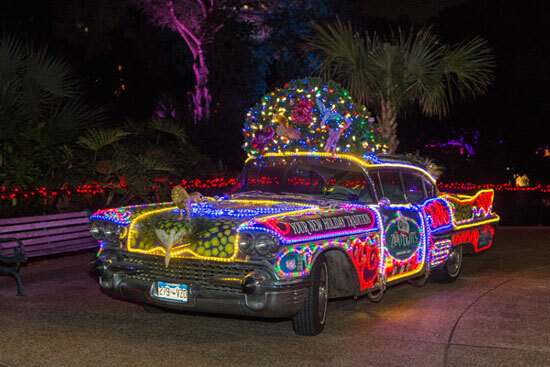 Holly Berry, the 1958 Cadillac that is the official ‘mascot' of Zoo Lights. Holly puts on a light show with over a thousand lights and synchronized music. Watch for the enchanted forest, animal sculptures and tooting holiday trains. The path even winds through the zoo's cat habitat with cougars, jaguars, lions, leopards and more. Non-members pay $10 ($12 at the gate), members pay $7 ($9 at the gate), and children under 2 are free. Enjoy the variety offered by this Houston attraction! If you do even a fraction of the above, you'll have earned a holiday with your feet on the coffee table, a hot chocolate in your hand, and adoring loved ones taking care of the dishes. But don't count on it.